To break the grip of corruption and black money, we have decided that the five hundred rupee and thousand rupee currency notes presently in use will no longer be legal tender from midnight tonight, that is 8th November 2016. 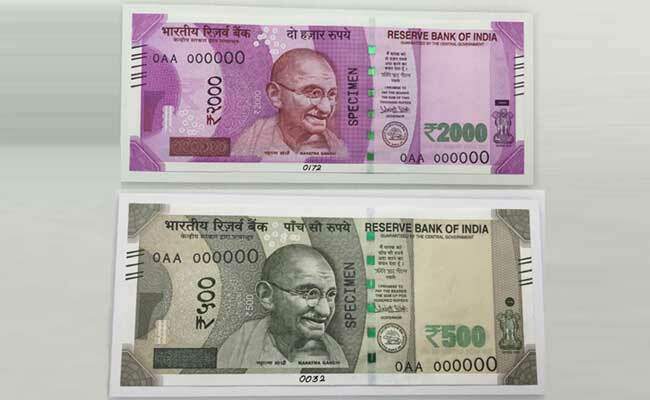 This means that these notes will not be acceptable for transactions from midnight onwards. The five hundred and thousand rupee notes hoarded by anti-national and anti-social elements will become just worthless pieces of paper. The rights and the interests of honest, hard-working people will be fully protected. Let me assure you that notes of one hundred, fifty, twenty, ten, five, two and one rupee and all coins will remain legal tender and will not be affected. As per Reserve Bank of India data, Rs. 14.18 lakh crore or $214 billion at current USD-INR exchange rate, 85.4% of total Indian currency in current circulation, will become useless paper from midnight of November 8, 2016. By 2015-16, Rs. 500 bank notes make upto Rs. 7.853 lakh crore whereas Rs. 1000 denomination notes add upto Rs. 6.325 lakh crore of total 16.597 lakh crore worth of currency in circulation. Practically, if you don’t exchange or declare your money, the Government of India will be richer by Rs. 14.18 lakh crore or $214 billion. What Will Happen To My Money? You don’t have to panic. Your money is safe. Though, Banks are closed today but from November 10, 2016, you can go to your bank or nearby post office and get your old Rs. 500 and Rs. 1000 notes exchanged with new Rs. 500 and Rs. 2000. The new Rs. 500 will have Red Fort on back side and Rs. 2000 will have Mangalyan, signifying strong roots attached to Old India and a move toward New Rising India. There will be no limit on deposit, but initially you can only withdraw upto Rs. 10000 in a day or Rs. 20000 in a week. 1. Railway, bus, and airline ticket counters. 2. Hospitals and pharmaceutical stores. 3. Petrol, diesel and gas station. 4. State consumer co-operative stores such as Kendriya Bhandar, Safal, and Army Canteens. 6. Crematation and burial grounds. How This Will Affect India? 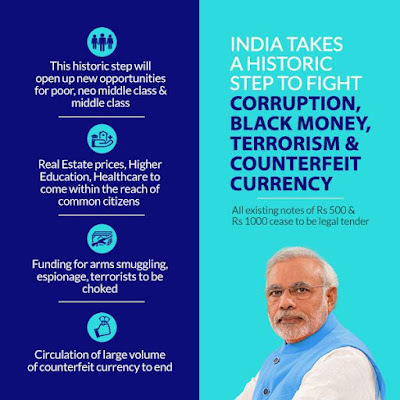 As per infographic released by PMO India on social media websites, the historic step will impact in following ways. 1. New growth opportunities for poor, neo-middle class (lower middle class) and middle class (higher middle class). 2. Make real estate, higher education, and healthcare within the reach of common citizens. 3. Choke up terrorist and naxal funding. 4. End the circulation of counterfiet notes. Is This Decision Taken in Hurry? This decision not taken in hurry, as pointed out by the Prime Minister, Secrecy was essential for this action. The step can be traced back to very first decision of Prime Minister led NDA government to form a SIT on black money. Then, a law was passed in 2015 for disclosure of foreign black money within three months by paying 60% tax. Agreements reached with many countries, to add provisions for sharing banking data. New strict law brought in force to curb down undeclared (benami) transactions in August 2016. A scheme was introduced for declaring black money by paying 45% as penalty. The scheme ended on September 30, 2016. The efforts brought more than Rs 1.25 lakh crore of black money in public. I believe, the decision is historic, and some deemed it as a masterstroke by Prime Minister Narendra Modi. But it has its flaws. Though, the Government and RBI are saying that they will launch higher denomination notes in a restricted manner, but looking at total face value of Rs. 500 and Rs. 1000, 14.18 lakh crore, this does not seem possible. Rs. 2000 is a quick fix. Hope, it will not end up like Rs. 1000 bank note, in a longer run. Instead of Rs. 2000 denomination, they could come up with a much lower Rs. 200 denomination, a denomination which will be more practical in use. But decision has been taken. Hope for the best.